SET 2019 registrations begun on 24th January 2019. Only the candidates who have filled the SET 2019 application form can download the SET 2019 Admit card. 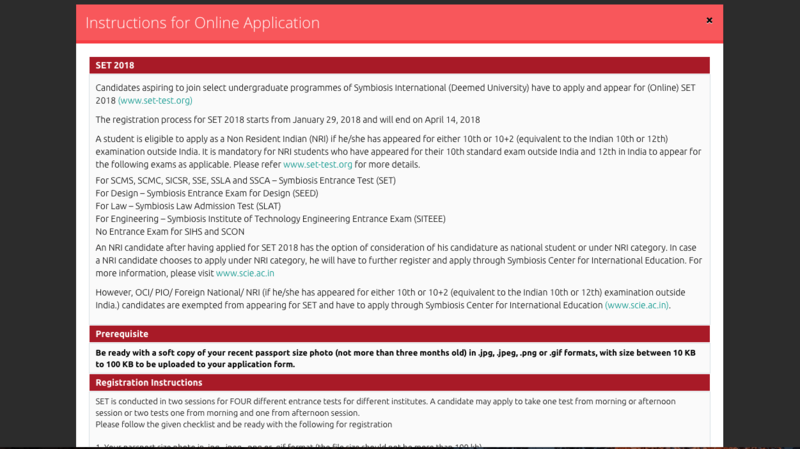 Note: The aspirants who meet the eligibility criteria can apply for Symbiosis Entrance Test (SET) 2019 on the official website. Step 1: Before starting the application process, the candidates who have satisfied the eligibility criteria will have to "register" themselves. 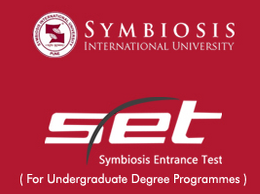 Step 2: When you click on the "Register" button, a unique SET ID will be generated for Symbiosis Entrance Test (SET 2019). The page will be redirected to Instructions For Online Application. The candidate has to go through all the instructions carefully and scroll down for continuing. Select the checkbox at the bottom and press "I Agree". Step 3: After clicking "I Agree", the page will be redirected to the registration page. Enter the details like Name, Gender, DOB, Nationality, Category, NRI, if any. 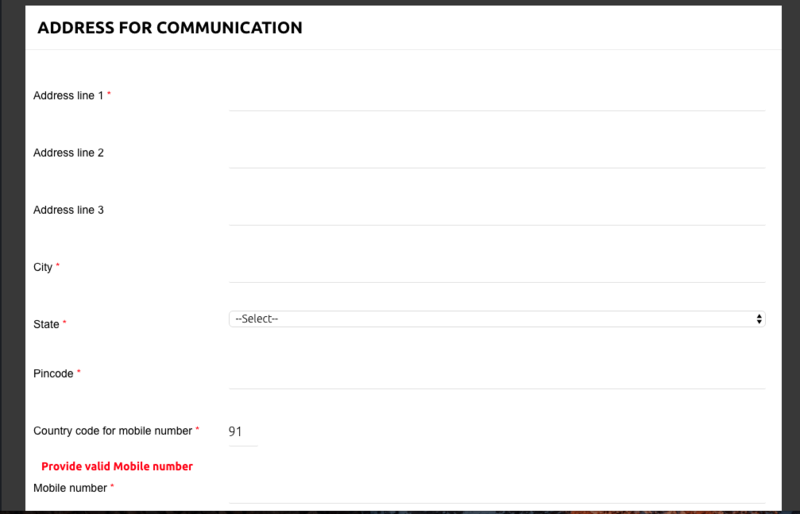 Step 4: In the next step, enter the Address For Communication like Address 1, Address 2, Address 3, State, City, Pincode, Mobile no, Alternate Mobile no, Valid Email Address. Step 5: In the Next Step, enter your S.S.C (10std) details like Board name, Percentage of marks obtained by the candidate, Year of Passing. Step 6: In the next step, enter your H.S.C (10+2 std) details like Education Background, Year of passing details. Step 7: In the next step, add your 12 digit Aadhar Card number without giving space. Step 8: In the next step, select the Programme and Discipline Preference from the given programs like SLAT (SET-Law)/ SEED (SET-Design) which are in the morning session and (SET-General) and (SET-Engineering) which are in the afternoon session. The candidate can select the program from the given below list. Step 9: In the next step, select the preferred city for the exam in the given choices. The candidate can put 3 preference of SET 2019 exam centres accordingly. Be careful while giving city preferences, as it cannot be changed, once payment is done. Step 10: In the following step, select how did you learn about SET 2019 exam from the given drop-down list. 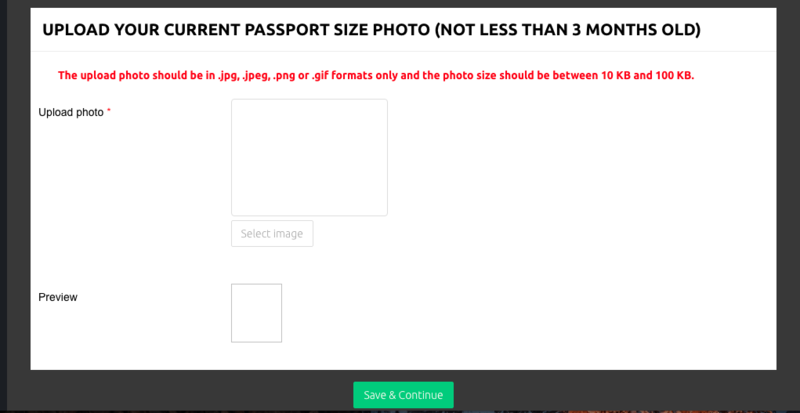 Step 11: In the next step, upload your current passport size photograph which is not old than 3 months. The size of the photo should be between 10KB-100KB and the format should be in .jpg, .jpeg, .png, .gif. After uploading select save and continue. Step 12: After save and continue, you will be redirected to the payment page directly. The payment can be done through Debit Card/Credit Card, Internet Banking, Demand Draft. Make the payment and download the application form for further reference. A candidate may take more than one paper. He/She will have to choose and register for one paper from the morning session (SLAT/SEED) and/or one paper from the afternoon session (SET/SITEEE). You will not be able to add a new session (entrance test) after the application is saved and a fresh registration will have to be made. 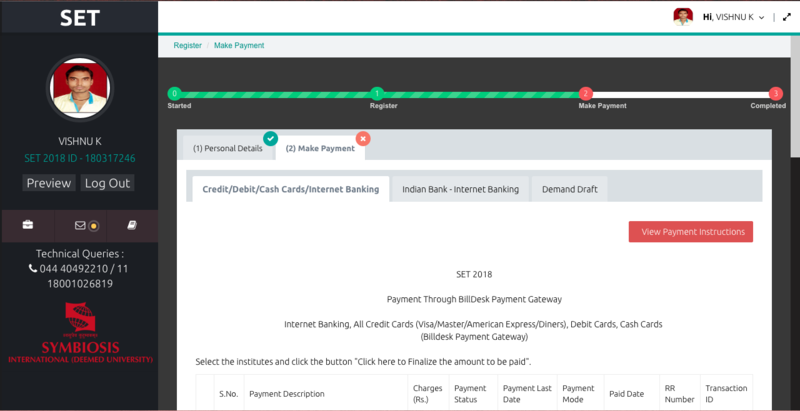 While paying SET Fee: While paying Symbiosis Entrance Test 2019 fees online, a candidate may also pay the application fees for admission to the preferred institute. After closing of payment: Even after the closing of the payment for SET application, a candidate may still apply through the Symbiosis Entrance Test website. Register separately for SET: A candidate who satisfies the eligibility criteria may also register separately for Symbiosis Entrance Test and apply to an institute. Preferred program: A candidate who satisfies the eligibility criteria should ensure that the preferred program is selected for SET 2019. Candidates cannot apply to an institute that does not accept the score of the test that you choose to give. For example, if a candidate chooses to give the General test only, they cannot apply to SLS. Similarly, if the candidate chooses to give the Law test only, they cannot apply to SSE or SCMS or SICSR. The schedule will be published: The schedule for the same will be published on the websites of the respective institutes. The schedule of the selection processes will be announced on the website of the Institute. Hence, students are advised to visit the selected institute's website periodically. Do I need gap certificate? I want to take admission for BSC economics for the actual 18-19. Do I have to attempt JEE or CET for the same? No, you can get admission based on SET score. To know more about the eligibility criteria, Click Here. What is the Application process for the SET 2017 examination? Candidates can fill the Application form through online mode by visiting the official site of Symbiosis University. Prior to filling the form, the applicants will have to register themselves after which a unique SET id will be generated. Using this they must log in onto the official website. Then the applicants must upload the scanned documents of a recent photograph and signatures in the appropriate formats. Then, the applicants must pay the application fees of Rs.1500 which is to be paid via credit/debit card, net banking or e-challan or DD payment. The applicant then must submit the application form and also take a printout of the same for future use. Students should note that it is compulsory to complete the registration process by filling up the online application form and submit it successfully so as to appear for the exam on the decided date. Symbiosis is known for quality education and offers an array of undergraduate programs in Law, Management, Computer Studies, Health Sciences, Design, Media & Communication, Economics, Engineering and Liberal Arts. What is the SET 2017 application procedure? The candidates have to register themselves after which a unique SET ID will be generated. Using this they must log in onto the official website. Candidates can fill in the online application form available on the official website. The applicants must upload the scanned documents of a recent photograph and signatures in the appropriate formats. The applicants must pay the application fees of Rs.1500 which is to be paid via credit/debit card, net banking or e-challan or DD payment. The applicant must submit the application form and also take a printout of the same for future use. Students should note that it is compulsory to complete registration process by filling up the online application form and submit it successfully so as to appear for the exam on the decided date. 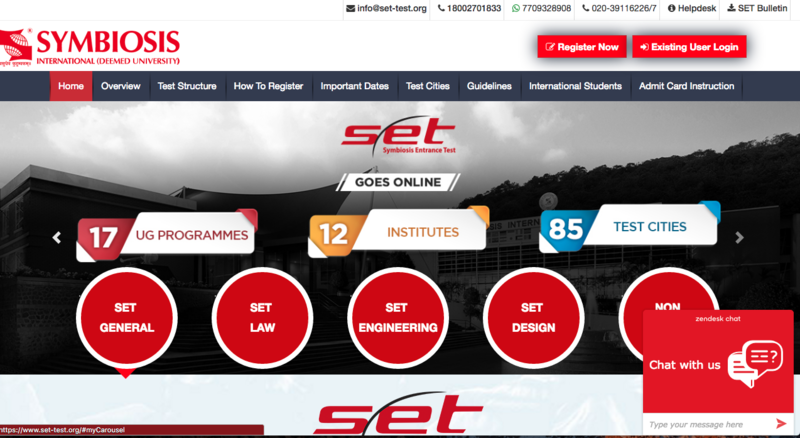 What is the application procedure for the SET exam through the SET website? If the candidate wants to apply through the SET website then while paying the fees online, a candidate may also pay the application fee for admission to the preferred institute. Which tests I need to take for Symbiosis Institute of Design (SID) in SET 2017? You may have to give the Design test and the Engineering/ Health Sciences test to apply for SID, SIT, SIHS and SCON institutes through SET 2017. May I know the Reservations available in SET 2017 for all category? Defence Quota - 5 % for SLS-PUNE and SICSR. Can i know what is the fee for the SET registration? The SET registration fee is Rs. 1500/- for any SET applicant. I filled up the form online and have taken the DD also. I do not have access to a printer to print the payment advice form. What do I do? You need to fill in your details with your SET ID on a plain white sheet and send the DD along with it. I registered online, but sent my DD without mentioning the SET ID. What do I do now? If you have a problem send an email to info@set-test.org providing the DD number, bank on which it was drawn, your name, date of birth, phone number and email id. Mention “sent payment without SET ID ” in the subject.